100% made in The Italian art of doing things well. Bringing processing to the Olbia plant in Italy, we have recovered an ancient tradition that provides value to our product. We do everything, processing the tuna from whole. Product quality control starts from afar, from the place of origin, with respect of the stringent parameters we expect in selecting our raw material. We choose them with care, looking into their eyes. Observing the whole tuna tells us about its characteristics, including information such as species, size, freshness and appearance of the meat, ensuring high and consistent standards. Precision is everything Expert selection of the parts is at the heart of ASDOMAR quality. The most advanced technologies accompany the artisanal capacities and careful eye of our workers. But it is in the moment of selection, in which the parts are designated to the various types of processing, that the experience passed on through the generations emerges. Knowledge that truly makes the difference in the product that ends up on our tables. All production phases for our tuna are carried out in Olbia. A location choice for our operations that has recovered a precious local artisanal tradition. 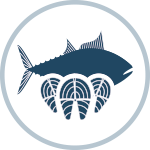 The decision not to use semi-processed products but only the whole tuna best enhances this tuna processing expertise, passed down from generation to generation. And it is a decision that makes a difference. Here we carry out all phases of production: from sectioning to packaging, following the fully Italian art of cooking, cleaning and selecting the fish. Only in this way is true Italian quality produced, giving an authentic value to the phrase “Processed entirely in Italy”, which is on our labels. 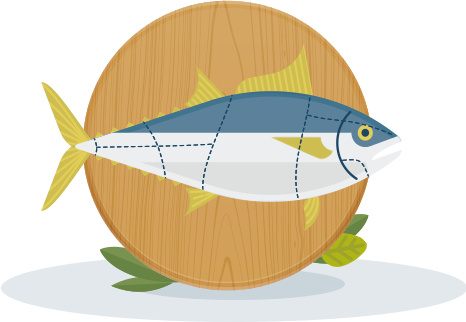 ASDOMAR MACKEREL Artisanal quality is also Made in Portugal. Acquisition of the Vila do Conde facility in Portugal has revived processing that is backed by an extensive tradition, highlighted in the manual processing of raw material caught by local co-ops in the waters of the Atlantic, onto which the Plant faces. Our quality is in the hands, attention and passion of many people. It is an invaluable treasure of experience and professionalism, which truly makes us proud. analysing histamine, mercury and Total Volatile Basic Nitrogen (TVB-N) levels. conducted with the support of sophisticated equipment. conducted on the incoming raw material through an initial cooking test, and then repeated on the finished product. of thermostatic stability and any free water, the presence of which could facilitate bacterial growth. analyses the product’s compliance to qualitative standards, in terms of colour and consistency. verifies the salt concentration in the product, ensuring optimal levels in nutritional terms. compares the two parameters to ensure the correct percentage of oil in the can compared to the quantity of product. determines the protein, glucose and lipid content of the product and evaluates the content in terms of moisture and ash. Certifications Our quality is a true guarantee of safety. Significant resources have been invested in food safety, with the creation of a cutting edge facility within the Olbia Plant, accredited as a third-party laboratory for analysis of tuna and oil. However, the entire management system implemented in Olbia and Vila do Conde is certified according to standards recognised at the international level.